I feel drawn to the light, silence and calm that icons radiate, and hope to pass on the divine realities that they depict to help others move ever closer to God. I grew up in the beautiful city of Dresden (Germany). After graduating from the University of Dresden (MA in German and English Literature and Art History), I lived and worked in Jerusalem for several years and met my husband on the road to Emmaus. In Jerusalem I also began to paint icons and have followed my calling to become an iconographer ever since. For me, painting icons is like a loving search for God, and an unceasing invitation to open the eyes of my heart to HIS beauty and love. I draw inspiration from marvellous icon masters like Andrej Rublev and Father Gregory Kroug, who, despite their struggles, had an immense spiritual maturity that makes their icons so timeless, beautiful and unique. 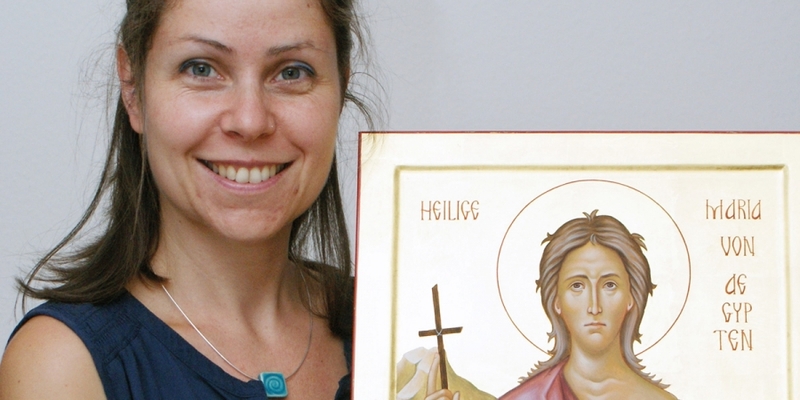 I feel very privileged and blessed to have been part of the Diploma Course in Icon Painting at the Prince's School of Traditional Art (London) and to have received the Nikos Sofialakis Scholarship. The unique teaching and spiritual guidance of Aidan Hart and the wonderful communion with my fellow students have shaped my icon painting and my spiritual journey in a very deep way. Since graduating from the Diploma Course in Icon Painting, I have completed several icons, including an icon of St. Tikhon of Moscow commissioned by the Monastery of St. Tikhon of Zadonsk, USA. I have also worked on designing my first iconostasis for a private chapel. Together with my husband and my two foster daughters, I live in Goldbach near Aschaffenburg and Frankfurt in Germany. I work as a full-time iconographer and am happy to take on commissions. I believe that icon painting is not just a holy art but a way of life. By painting icons, we begin to embark on a transformational inner journey that will shape our way of seeing and understanding the world. As an iconographer and human being, I hope that God will unceasingly guide me in portraying and proclaiming His love through my icon painting, so that it may continue to shine into our fragile world, lift the curtain between us and Him, and open our hearts, eyes and ears to allow us to feel, see, and hear Him. PA to the Anglican Bishop in Jerusalem, Public Relations Officer and Art.